Jungle Bros Treescapes offers comprehensive tree removal services in Adelaide and surrounding suburbs. Tree removal is a visibly simple yet difficult process requiring precision and technique. All material can either be removed or chipped on-site, for use as mulch in the garden. 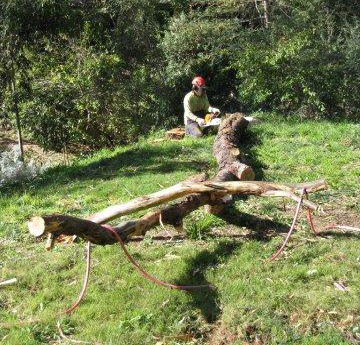 Our experienced chainsaw operators can also cut the wood into rounds for firewood. From large pine trees to eucalypts, palms, olives, natives and exotics – we can remove them all for you! Safe tree removal is our primary goal at Jungle Bros. This entails not just the safety of our team, but also the safety of our customers and environment. Our expert tree climbers use ropes and harnesses to access the trees. The limbs, foliage and trunk are then systematically deconstructed, taking care to avoid any damage to existing landscaping and infrastructure. Trees are especially prone to suffer from damage during storms. Therefore, having annual tree inspections are of utmost importance in taking care of your trees. Jungle Bros provides comprehensive annual tree inspections and management services. Our team assesses the condition of your trees and makes suggestions for further care and maintenance, including pruning and shaping, and health assessment of the trees in your backyard. These actions taken in the nick of time go a long way in improving the health of your trees and enhancing their resistance to storms. No matter the size of tree or the species, you can trust Jungle Bros Treescapes to safely and quickly remove it from site. Give us a call today for a quick quote.